In January 2017, Slowdive announced they had signed to Dead Oceans and were working on new material. On 12 January, the band released “Star Roving”, their first single in 22 years. On 28 March, they announced the forthcoming release of their fourth, self-titled album, along with the release of another single, “Sugar for the Pill”, from the album. According to the press release, the artwork and video for ‘Sugar for the Pill’ were inspired by Harry Smith’s spiritually-minded cult 1957 animation Heaven and Earth Magic . A Slowdive Twitter account followed by all the band members (excluding Halstead) was created in January 2014, hinting at a possible reunion. On 24 January, the Twitter account posted a link to the website slowdiveofficial.com, which displayed an image containing the text “here she comes…”, a reference to the song of the same name from Souvlaki. On 28 January 2014, it was announced that Slowdive had reformed to play the 2014 Primavera Sound Festival in Barcelona, Spain and in Porto, Portugal. Slowdive also announced a 20-date summer world tour including performances at the Electric Picnic Festival in Stradbally, County Laois, Ireland; the FYF Fest in Los Angeles; the Fortress Festival in Fort Worth, Texas; the Wave-Gotik-Treffen festival in Leipzig, Germany, on June 8; the Roskilde Festival in Denmark on 5 July 2014; the Radar Festival in Italy and the Off Festival in Katowice, Poland in August 2014. A North American tour, also 20 dates, was announced for October and November 2014. In May 2016, Goswell stated that the band were working on a new album. Slowdive are an English rock band that formed in Reading, Berkshire in 1989. The band consists of Rachel Goswell on vocals and guitar, Simon Scott on drums, Neil Halstead on vocals and guitar, Nick Chaplin on bass and Christian Savill on guitar. Several other drummers also briefly played with the band, including Adrian Sell, Neil Carter and Ian McCutcheon. Halstead is the band’s primary songwriter. Goswell and Halstead had known each other since early childhood in Reading, Berkshire. Scott left in 1994 and when Savill and Chaplin left the band soon after the release of Pygmalion, the remaining members renamed the band Mojave 3. 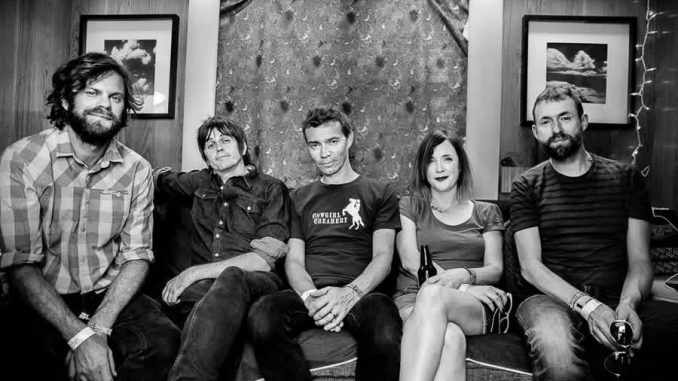 Slowdive reunited in 2014.